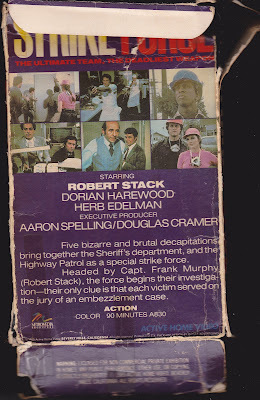 Captain Frank Murphy (Stack), Sgt. Paul Strobber (Harewood), Lt. Charlie Gunzer (Romanus), Sgt. Mark Osborne (Goodwin) and Sgt. Rosie Johnson (Noble) aren’t just any old L.A. cops. Together they take on the toughest crimes as an elite unit known as the Strike Force! Strike Force was an hour-long police procedural drama TV show that ran on ABC from 1981-82 and produced 19 episodes in total. Active home video decided to put out what seems to be the first two episodes edited together, and then release it to the burgeoning video store market that was hungry for boxes to fill its shelves. The plot this time around concerns a disturbed man that’s going around town with an axe decapitating people on Tuesdays. But the Strike Force must find out the link between the victims in time to save the next one on the murderer’s list. Can they do it? The 80’s were an amazing time - not only were shows like this being produced, but startup video companies were more than willing to release them into video stores all across the land (and beyond). Similar to what Vidmark did with Fortune Dane (1986). Just take some episodes of a show and put ‘em on video and see what happens. Even if the show was off the air, there was no intention of getting back on the air (like what happened with Family Guy) - it’s all about video store product for video store product’s sake. In that sense it’s very unpretentious and that’s very appealing. About twenty years before The Shield had it’s Strike Team, Robert Stack had his Strike Force. Stack plays a divorced guy who lives in a sloppy house with his dog and appears to be feeding it a brand of dog food called “Doggone It”. The generation of actors that includes Robert Stack, Peter Graves, Clint Eastwood and Chuck Connors will never be seen again. Now it’s just prissy, effeminate man-children like Leonardo DiCaprio. Thus, Strike Force will, if nothing else, remind you of a better time. Fans of shows like Adam-12 and Mannix will certainly appreciate what’s going on here, and the music of the show reinforces its strong A-Team vibe as well. This VHS tape in particular will appeal most to people nostalgic for this era or this show in particular. Being part of the Strike Force, the team gets to go undercover all together, dressing up as chefs or a construction crew to get the job done (during the restaurant sequence, watch out for a young Billy Drago playing, what else, a bad guy - maybe his one shot in Strike Force typecast him for life. The show’s influence is still carrying on today; maybe it’s more powerful and influential than anyone realizes). It also recalls back to a time before political correctness. For example, Noble wears a shirt that says “Junk Food Is Good For You!” - this probably wouldn’t be allowed today. 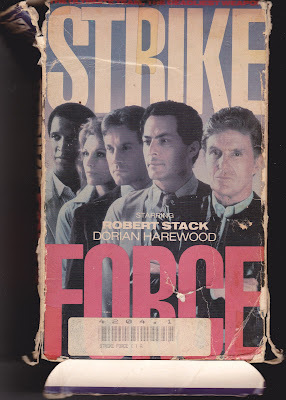 But the worst thing you could really say about Strike Force is that it gets a bit “standard” at times, but maybe that’s because there have been a lot of shows like it in the intervening years. Released in an Active home video big-box, the only “Unsolved Mystery” here is why this show isn’t as well-known today as it should be. 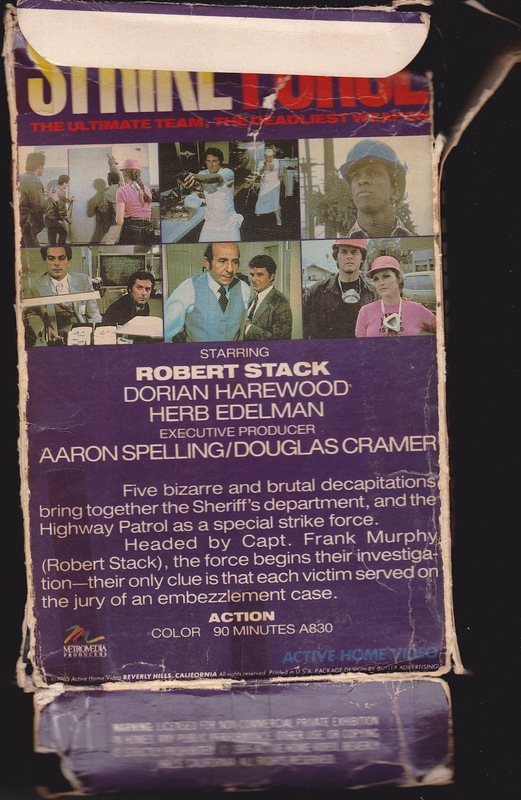 Something similar happened with the Stephen Lang film "Band Of The Band" it was basically 3 episodes of an unreleased TV show edited together, it was pretty good. Always wanted to see Band Of The Hand. Stephen Lang is always good. Definitely remember that. Good show too.